The best wine tasting experiences I’ve had the pleasure of enjoying have all been from older, mature bottles of wine. Depending on the producer, the vintage and the region, the definition of older and mature ranges from 10 to 100 years. Not every wine lover is going to agree. In fact, the majority of younger wine lovers just discovering their passion for wine most often prefer fresh, up front fruit and the primary aromatics enjoyed in young wines. But similar to the changes that take place in aged, mature wines, most wine lovers and collectors also mature and change with time. The same thing happens to their palate preferences. Eventually, many, if not most passionate wine lovers develop a fondness for properly aged, mature wines. In today’s modern, fast paced, instant world, the concept of buying wines to drink 10, 15, 20 or more years later is an archaic concept to most people. There are countless inventions in the marketplace all claiming to age a wine in minutes, right before your very own palate. Trust me. They do not work. There is no substitute for time. That is why the auction marketplace places such a massive premium on properly cellared Bordeaux or other wines. People buying those wines understand that with time, a wine becomes more than what was when originally placed in the bottle. Older, properly aged and cellared wine is more than bottled history, although there is value in that as well. For experienced wine tasters, the magic in the bottle does not truly display its complexities until it has become properly cellared and aged. The palate texture, flavor profile and levels of aromatic complexities experienced in older, mature bottles of wine offer unequaled tasting experiences that cannot be replicated in younger wines. How to buy older, collectible wines. There are three ways to accumulate end up with older, mature, properly cellared wines. First, you can inherit a wine cellar from a relative. If you’re lucky, that is a great way to start. Second, you can buy older vintages of wine. This is a good idea, if you have the money and are guaranteed good provenance, which looks easier than it really is. Lastly, you can follow in the footsteps of all the previous generations of wine lovers that bought young wines and aged them to perfection. This article is a guide as to why you want to cellar and age Bordeaux wine or other wines. If you are going to seriously collect wine, properly cellaring your wine is imperative. 99% of the world’s wine does not need cellaring. Most wines are in fact at their peak the day they are released But the wines that improve with age require proper care and cellaring to show their best qualities. Wine is a living thing. It changes with time in the bottle. Depending on the wine, it can take from years to decades for the molecular structure to change, but changes do occur. If you have any doubts about this, simply open a young bottle of wine along with the same wine from a previous vintage, perhaps from 15-20 years ago and you can easily see, smell and taste the difference. What happens when wine ages? The first thing tasters notice is a change in color. Depending on the grape varietal, depth of color can be an indicator of quality. How to visually look at a wine to buy for cellaring. Depth of color is related to the amount of anthocyanins and pigments in the wine. For young wine made from Bordeaux varieties, in other words, Cabernet Sauvignon and Merlot based wines, if the wine in the glass is inky, possibly showing dark purple or deep blue tints, the wine is going to be powerful, concentrated and made from ripe fruits. The wine will probably be lower in acid and higher in Ph. For an example on the other side of the coin, young Bordeaux wine that is lighter in color will be less ripe. The wine will also be more acidic and lower in pH. As I mentioned, darker, deeper colors most often indicate a depth of flavor and concentration in the raw material and flavor. This alone does not mean the wine is good. It’s simply a potential indicator of quality in a young wine. However, a proportionate depth of color in a mature wine is a good indicator that the wine can be good, provided the wine has been cellared properly. It’s important to understand that the color in a wine is going to change after several years or decades in the bottle. With time in the cellar, the color of the wine will slowly morph. The edges of the wine in the glass will gradually begin to lighten. With time the color of the wine will continue to lighten from a dark red or purple to more of a ruby shade. Additional bottle aging will further lighten the color. The color will continue moving from light ruby to brick to orange. Depending on the wine, that process could take 20, 30, 40, 50 or even 100 years. What happens to a wine as it ages. As wine ages, the tannins that helped the wine age begin to soften and slowly dissipate. This is because the tannins in the wine change with time. This change alters the molecular structure of the wine providing a mellow, soft and pleasurable experience to the taster, that is quite different than what was experienced in the wines youth. The chemistry behind what happens when wines age is due to polymerization. When polymerization takes place, tiny molecules begin to attach to other small molecules and with time, these new molecular structures become longer. The size of the tannin molecules can also increase or decrease. When that happens to the tannins in the wine, because the polymers and molecular structures have lengthened, and the size of the tannic molecules has changed, the wine feels smoother and often silkier on your palate. This is part of the reason older, mature wines are so valued by numerous collectors and wine lovers. The aromas in a mature wine are often off putting to newer collectors. The primary aromas of blackberries, cherry, plum and cassis fade while notes of tobacco, truffle, earth, smoke, cedar wood, cigar box and forest floor begin to emerge. This happens as the wine shifts from its youth to maturity, when the initial, primary fruit and grapey characteristics shift to the wines secondary or tertiary profile. These earthier, more complex scents are prized by collectors. Along with the change in texture, flavor and aroma comes the creation of sediment in the bottom of the bottle. Sediment is a good thing. It shows that the wine was sound and has moved from its youth to maturity. However, sediment does not look good in the glass and it tastes worse than it looks as it imparts a bitter sensation. It is important to avoid pouring the sediment in your glass. This is accomplished by either by decanting the wine, or standing an older bottle of wine up for a few days prior to opening and pouring gently. Different wines go through different aging curves and life cycles. Those curves and life cycles are affected by the style of quality of the vintage. The best vintages are going to allow for a long life. Lighter, off or bad vintages must be consumed early in their life. There are many reasons why red Bordeaux wine enjoys its reputation for aging. The best Bordeaux wine from a great vintage can easily age and improve for decades. For example, Chateau Latour and Chateau Haut Brion from 1961 are still young and vibrant, if well stored. Many of the better Left Bank Bordeaux wines from vintages like 1961, 1959 or 1945 can still offer great tasting experiences. However, wines from vintages not meant for aging, for example, 1991, 1992 Bordeaux should have been drunk up years ago. As a different example, many Right Bank Bordeaux wines, due to their Merlot dominated blends and higher degree of ripeness are often drinkable with less aging, than their Left Bank counterparts. From a different vantage point, as a general rule and palate preference, I like Chateauneuf du Pape at all ages of life. For me, the wines are great the day they are released. Yet, they age well and are often delicious when 10 to 15 years old. But after 20 years, most start to fade. Wines from Cote Rotie and Hermitage can demand years to develop, and due to their more acidic profile, they are not much fun to drink in their youth. I have a completely different point of view on aging California wine. I enjoy many for their exuberant, fruit forward, lush qualities young in life. The majority do not add the same secondary characteristics as their counterparts in Bordeaux, yet they can age for 10, 15, 20 or more years. Aging curves of a wine are also important to keep track of. Bordeaux wine has a track record for aging and evolving in the bottle. Bordeaux wine also enjoys a long aging curve. As a general example, the following rule of 3 works for most Bordeaux wine. If a Bordeaux wine takes 10 years to age, it will remain at its peak for 10 years before taking 10 years to fully decline. Using a slightly longer example, a Bordeaux wine with a 60 year life span will take 20 years to reach maturity. It will remain delivering a peak tasting experience for 20 years and will slowly decline over its remaining 29 years of life. How to invest in wine. Buying wine as an investment has historically been a smart move. Today, however, it is more difficult, primarily because the cost and value of wines has skyrocketed since the mid 1990’s. On the other hand, there is more money in the world and the demand for fine wine has never been stronger. If you are going to buy wine for investment, know it is risky, as there have been numerous crashes in wine prices over the years. That being, there are a few things you should know, that will help you make the right choices. Buy the best wines you can afford. Purchase them in unopened, 12 bottle, wood cases. Save your receipts, to show you were the original purchaser. Only buy the best wines in the top vintages. Do not try to save money and buy famous names in off vintage, but the famous in the best vintages. The best chateau, wineries are going to pay the highest dividends over time. 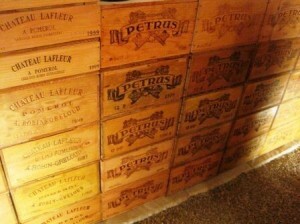 In Bordeaux, Petrus, Le Pin, Lafleur, The First Growths and the other famous names are the wines to buy. In Burgundy, Domaine Romanee Conti, Rousseau, Leroy and other top estates continue escalating in price. In California, it is more complicated. But generally speaking, wines with a track record, Screaming Eagle, Colgin, Sine Qua Non, Harlan and a few other wineries that earn 100 Pt scores are at the top of the list, for investment purposes. Why cellar wine? As I mentioned in the previous paragraph, most wine does not improve after bottling. But the world’s best wines improve, evolve, soften and develop not only extremely complicated aromatic bouquets, but textures of silk and velvet that are unlike those found in young wine. Buying older, mature wine at auction has its advantages and its problems. Provenance can be difficult to ascertain. 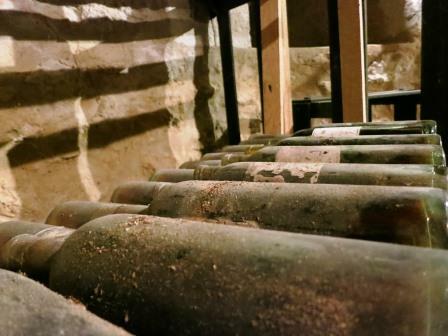 Every wine auction trumpets the cellaring conditions of the wine they have for sale. Can this be verified? Not unless you personally know the owner. However, buying full cases of wine from a packed cellar is a potential sign of quality. Most people buying and selling wine by the case have the ability to properly store and cellar the wine. Single bottles, wines in mixed lots, cases with 11 or 10 bottles could be a sign of imperfect provenance. That does not even begin to take into consideration the issue of fake or counterfeit bottles for sale at auction. Not that every bottle sold in auctions is to be feared. It’s just something that collectors need to consider, especially when bidding on older, more expensive bottles of wine. There is only one way to ensure perfect provenance. That is to plan ahead, buy the wines you want when they are released and properly cellar and age them to perfection. You will end up with better wines that provide the best possible tasting experience when these wines reach maturity. This is a fact without dispute. But that requires a lot of patience and a place to cellar your wine to maturity. Take it from me, as someone how has been cellaring wine for close to 20 years, the wines from my cellar offer dramatically better tasting experiences than those from bottles purchased after years in the marketplace. My bottles are younger, fresher and offer a more complete, tasting experience. What happens when a wine is too old. It’s important to remember, most wines are not meant to age. Wines are living, breathing things and they do not live forever. Wines meant to age gradually move from their youth to maturity and eventually, like all living things, die from old age. When a wine is past its prime, the color will take on brown or extremely bricky colors. The wine will not taste of fruit. You can experience tart, bitter or acidic flavors. The wine could smell of vinegar or other unpleasant aromas. When buying older vintages of wine, a physical examination can tell you much of what you need to know to assess the potential level of quality in the wine. First, look at the level of the fill in the wine. Is the amount of wine in the bottle, based on the distance between the cork and the wine appropriate for a wine of its age? The shape of the bottle is going to impact your view and the amount of ullage in the wine. For a Bordeaux wine 30 years old or younger, when well stored, the fill should not be below the bottom of the neck. A lower fill could be fine, but why take the chance? A fill level into the shoulder is fine for a wine that is 50 years old. This is natural. As a wine ages, the wine will continue to evaporate. Too much evaporation for its age is a potential sign of an unhealthy wine. The color of a wine is also a good indicator of a wines condition. There is an easy way to look at a wine in the bottle for a guide as to the wines health and drinkability based on its color. Hold either the neck or the bottom of the bottom at an angle under a bright light. Look at the color of the wine. If the color shows a red or ruby color, that is an indicator of a potentially, sound bottle of wine. If the color is closer to black or deep brown, that wine is probably dead and should not be purchased.